All the walks featured in this section are between 3 and 8 miles in length (5 - 13 kilometres). Click on the plus to find more detail of each walk. For a flavour of the landscape and views, watch our Literature and Legends short film. An easy walk (along a private road) into our cultural history through ancient semi-natural woodland, spectacular loch and mountain views. It follows the Art & Literature trail, with information about the famous artists and writers who were inspired by this landscape. As well as being a walk with a cultural history, it also passes through ancient semi‐natural woodland, and has superb loch and mountain views. 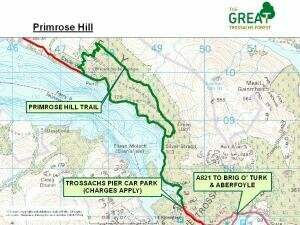 The walk goes to the Brenachoile View point on the northern shore of the loch, with superb views of the loch and across to Ben Venue- and a great picnic spot. From the Trossachs Pier car park follow the private road leading along the loch shore. Please note that cyclists and some cars use this road. After 2 miles you will reach Brenachoile point and the return route is back along the private road. The steep climb offers rewarding panoramic views over Loch Katrine as well as offering an atmospheric woodland experience at Primrose Hill. After about 1 miles take the green waymarked track to the right and wallk along the ridge parallel with the loch. The loop track returns to the private road just after Brenachoile Point. A fantastic new walk along the north shore of Loch Venachar. The path goes along the hill side, through the beautiful Milton burn and newly created woodlands. Views stretch over Loch Venachar to Loch Drunkie. At the end of each end of the path are food and drink premises. Can be walked as part of a longer loop or as a straight walk on its own. Toilet, visitor information available at Glen Finglas Visitor Gateway and a tea room and pub are in nearby Brig o' Turk. Follow the signs for The Great Trossachs Path to take you along this path. Passing through ancient and newly regenerating oak woodlands, the steep climb at the start rewards you with fantastic views over Ben Venue and Lochs Venachar and Achray. The waterfall viewpoint is a worthwhile and short diversion from the track. From the Lendrick Hill car park, go over the bridge and then follow the path through the Lendrick woodland. At the top of the hill take the track to the left and continue along until you reach the tarmac road, where you turn left to return back through Brig o' Turk village. For more details see the Woodland Trust Glen Finglas leaflet. A fantastic walk between Stronachlachar along the historic Old Military Road and the Garrison at Inversnaid. The pier cafe is at the Stronachlachar pier and the Inversnaid bunk house and Inversnaid hotel also serve food and refreshments. From the Garrison car park take the path to the east towards Stronachlachar and Loch Katrine along The Great Trossachs Path. The route can be walked in the opposite direction, although there is limited parking in Stronachlachar. This is a popular and relatively short hill walk which is steep in places. The ascent takes you on a clearly marked path through the newly regenerating forest beside a burn and then up a fairly steep final stretch. You are rewarded for your efforts with great views over Loch Katrrine from the summit. Nearby cafes can be found at Trossachs pier, Brig o' Turk and Venachar Lochside. The Byre Inn is also in Brig o' Turk. This route departs from the Ben A'an car park near Loch Achray signposted from the main road. Please note - car park charges apply. This starts from the Lendrick Hill car park and follows the path netork for the first couple of kilometres. On leaving the path network, follow the waymarker posts which take you near the summit of Stuc Odhar and then returing back to the path network in Glen Casaig.